What started as a dream ended on a high note when the Namibia Rugby Union (NRU) hosted the Get Into Rugby Development season final tournament between Van Rhyn Primary School and Khomasdal Primary School recently. One hundred and sixty boys and girls participated in this fun day joined by parents, teachers and volunteers. 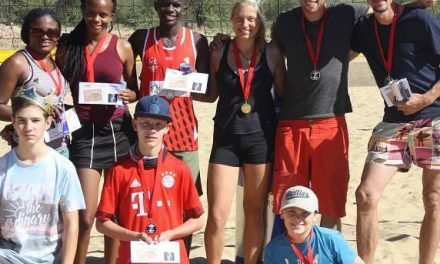 Later that day, the youngsters witnessed Namibia defeat Kenya in a tri-nations tournament. Jane Katjavivi, Chairperson of the FNB Foundation, was pleased to see the enthusiasm of the children – the future rugby stars of Namibia. She congratulated all participants on their efforts and wished the NRU and its Development Manager Mr. Kemp well. She said: “We know that rugby is one of the most popular sport codes in Namibia – both for players and spectators. It has also been one of our international sporting success stories.” Katjavivi, however, said rugby in Namibia was currently not at the level where it should be. “A number of challenges have faced the Namibia Rugby Union and the sport code in general. However, I think we are all excited to see that this is changing,” she added. She said it was FNB’s and the FNB Foundation sincere hope that the Get into Rugby Development Programme would re-kindle the greatness of the sport in the country. 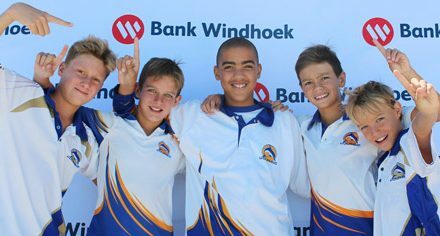 “The FNB Foundation is pleased to be a partner and contribute to the work of the Namibia Rugby Union at this developmental level, thereby developing skills and creating enthusiasm and love for the sport at a young age.